If you like it, you should endorse their file. Thank you to oldman42 for their help with turning the mode into a ModuleConfig.xml based FOMOD! 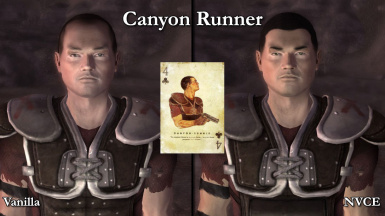 Canyon Runner - Skin tone made light in respect to card artwork. 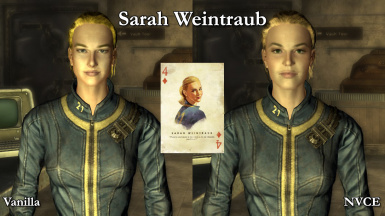 Captain marie Pappas - Minor facial changes in respect to card artwork. Jessup - Changes to face. 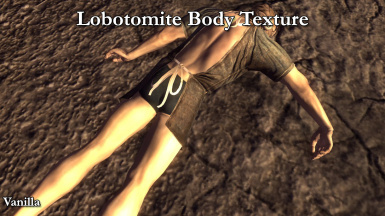 Joshua Graham's missing body texture has been fixed. 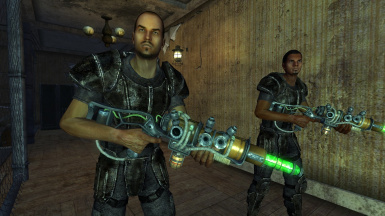 Lobotomites have been given default 'bald' hair to avoid errors. 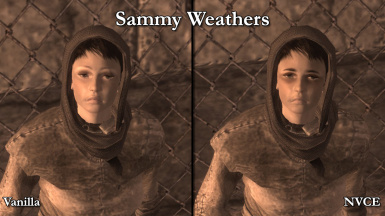 Changes made to the Weathers family. Jessup - Complexion made tougher in respect to his appearance "All Roads"
NVDLC04 - All MARKED MEN have variations. 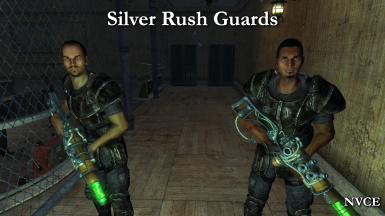 NVDLC04 - All IRRADIATED soldiers both NCR and Legion have different variations. New FOMOD Insallation - Required you delete the BSA file from previous version. Perhaps a clean install might also be beneficial. 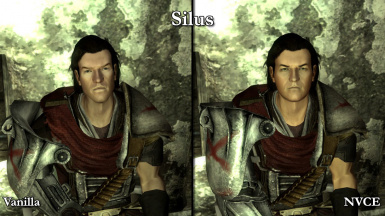 Face-Only version now possible with WryeBash. 1ERefugeeAAM had its charisma reset back to 0 from 16. 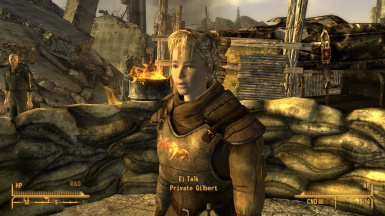 DLC01 - Gave Elijah's female race version a default hair style to resolve an error which would actually never happen. Just for the sake of fixing a bug. 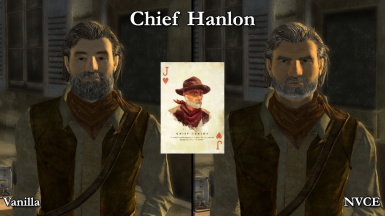 Ambassador Crocker - Race change in respect to the Collectors Edition Cards. 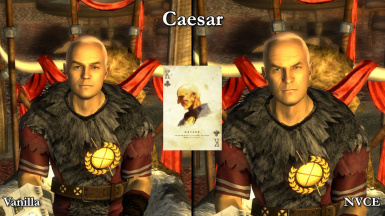 Caesar - Slight change in respect to CE cards. Johnson Nash - Slight re-edits to face for better eyes. 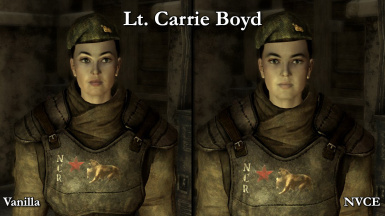 NCR TROOPERS - Misc changes. 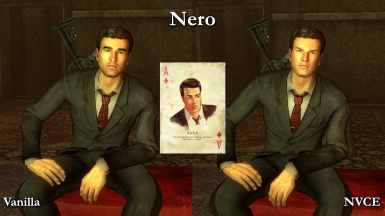 Nero - Complete revision from scratch. 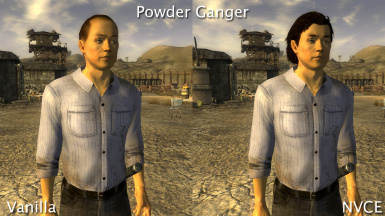 Powder Ganger - Misc changes. Ranger Ghost - A revist due to previous problems. 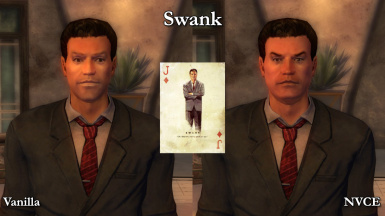 Swank - Slight facial texture alterations. TRAVELLING MERCHANT - Misc changes. Vulpes Inculta - Reworked from scratch. President Kimball - Facial change with better proportions. Green Eyes have been made slightly more prominent though not immediately noticeable. 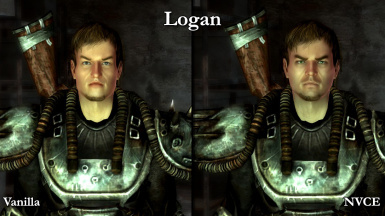 Lobotomites Faces Reconstructed. Each have more unique instead of reusing bases. 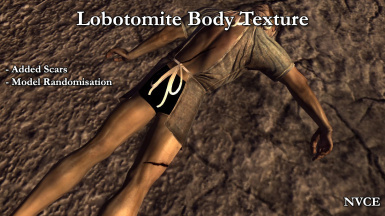 Lobotomites now have proper Upper Body texture with scars. Father Elijah face regenerated again. Father Elijah given Blast Back Hair and changed race to work. 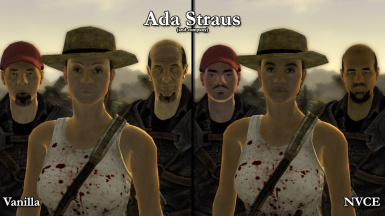 Ada Straus has had facial reconstruction. 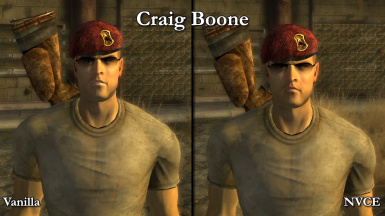 Atomic Wrangler Crier has gone another slight alteration to fix discolouration of the face. 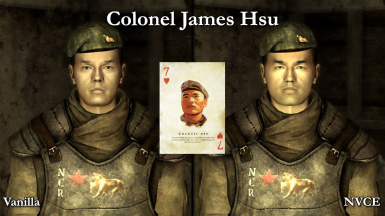 Colonel Hsu finally visited and made more truer to collectors card form. 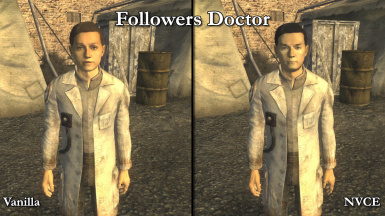 Doctor Kemp has been slightly changed back to his original look. FIXES made to Legionary Assassins to match the recent patch update. 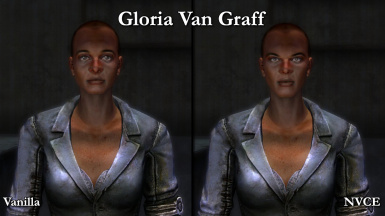 GOMMORAH PROSTITUTES have all gone through major reworking. Kings Groupies both undergone significant change again. 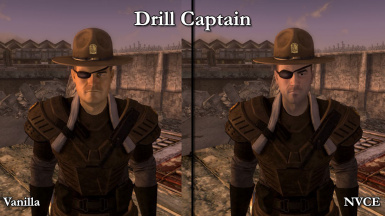 Ranger Dobson has gone through another change for a more authorative look. 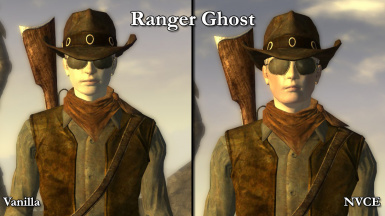 Ranger Ghost has been altered slightly to address continuing Glasses clipping issues. 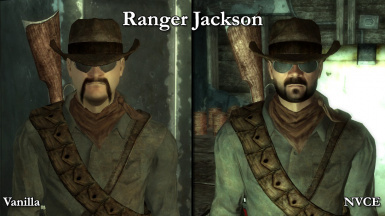 Ranger Jackson has been redone again in slighter respect to Dracomies' NVR. 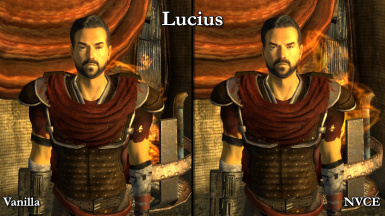 Senior Knight Lorenzo has had some facial alterations and hair changed for 'added seniority'. 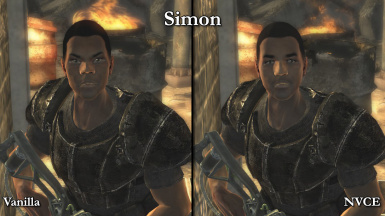 Simon has gone through changes again. Given a softer look. Beagle - NAME CHANGE occurs when appropriate. Talking to him while he's Deputy Beagle, he'll confide that he is no longer a Beagle. Afterwards, he is now called Beagle. This always urked me before. Cpl Walter Hornsby - Slight facial cahnge to skin tone and chin. 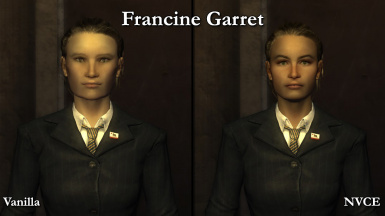 Francine Garret - Complete reconstruction of fac and skin tone made to match James Garret (Twin). Head Scribe Taggart - Facial reconstruction. 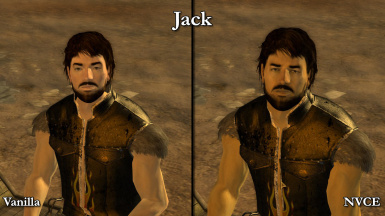 JACKALS GANG MEMBERS - Various changes. 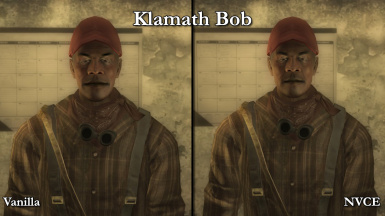 Klamath Bob - Slight change around of face and skin tone. Legionary Instructor - Brow Ridge lowered. 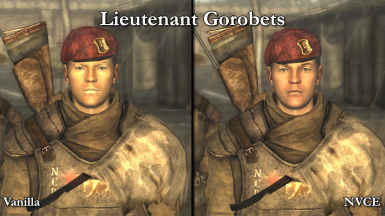 Lieutenant Gorobets - Slight skin tone change. 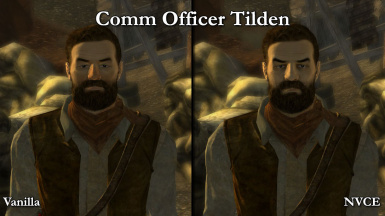 Lieutenant Markland - Eyebrows added and face altered slightly with changes to Neck, Jawline and Nose. Logan - Slight facial change for a hardier look. 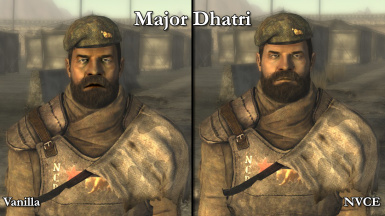 Major Dhatri - A slight skin tone change and mouth fix. Martina Groesbeck - Complete reconstruction to exhibit a sadder tone to her. Paladin Sato - Minor changes to brow ridge. Papa Khan - Upper facial area (brow ridge) altered slightly and given eyebrows. Roller - Hair changed slightly and brow ridge altered. 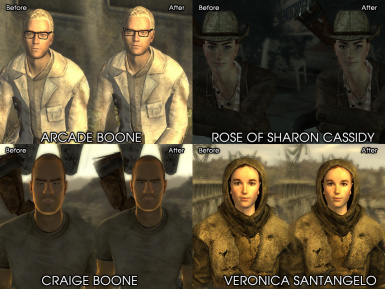 SCORPIONS GANG MEMBERS - Various changes. 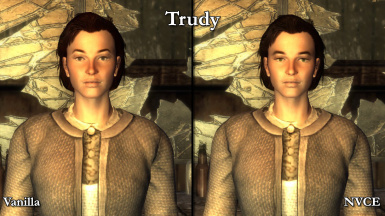 Trudy - Was holding off on this character for a while. 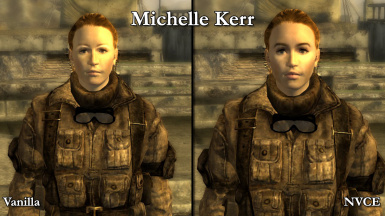 Made slight alterations to facial tone, have changed hair tone slightly and hairstyle to a more 'motherly' style as she is described. Have attempted to preserve he hardiness however. Tyrone - A re-edit changing the skin tone and face reconstruction. YVette - Various slight facial changes, and hair made more natural tone. Chavez - More natural hair tone. 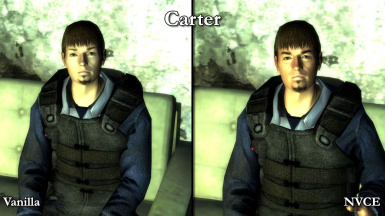 Chet - Slight facial features changed proportions. Nose made slightly thinner. 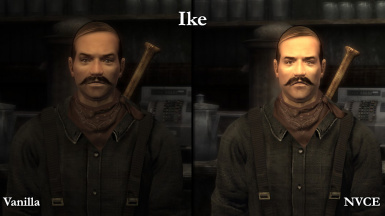 Eddie - Slight changes for a tougher demeanor. 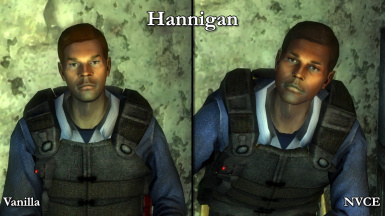 Hannigan - Reconstructed face and more natural hair tone. 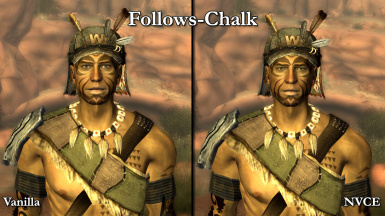 JACKALS MEMBERS & LEADER - Changes appropriate to tone and face. 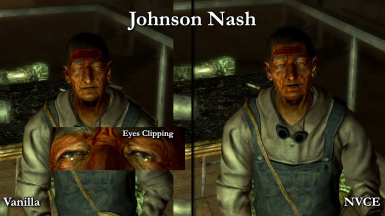 Johnson Nash - Eyes widened to stop clipping issues. 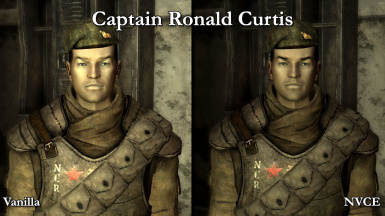 NCR RANGERS - Various changes. 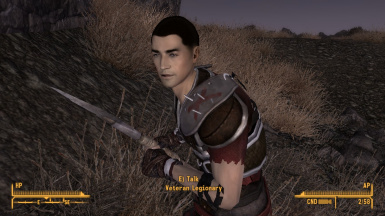 NCR Trooper (Messenger on Strip) - Slight modification. 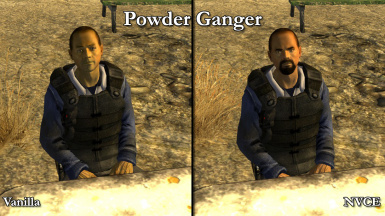 POWDER GANGERS - Misc changes. 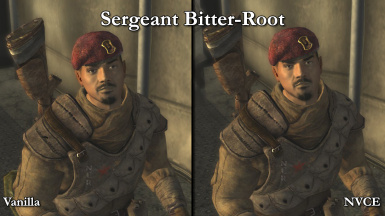 Sergeant Lee - Facial construction. 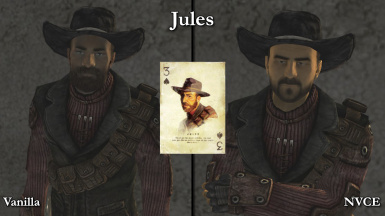 GOODSPRINGS SETTLERS - Various changes for more western feel. PRAETORIAN GUARD - Various changes for tougher look. Tomas - Hair tone more natural. 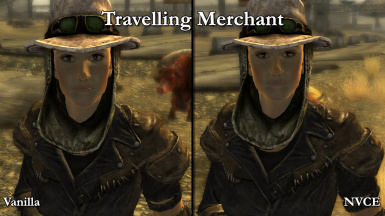 Travelling Merchant/Bounty Hounter - Skin tone changed. 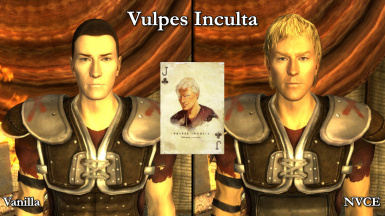 Vulpes Inculta - Slight facial edits. Various other changes I forgot to record. Oh well. 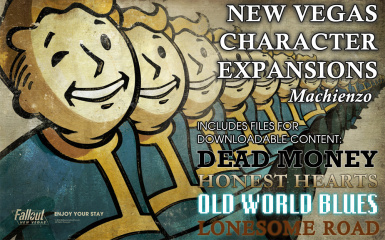 New Vegas Character Expansions (formerly NPC Cosmetic Fixes) is an NPC overhaul mod, with additional (slight) gameplay changes and bug fixes. "bLoadFaceGenHeadEGTFiles=" from 0 to 1, located under the [General] section. 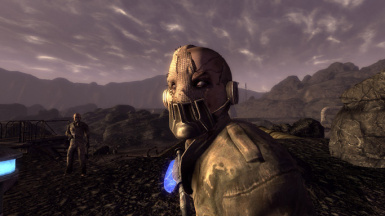 If the problem still persists, perform this integer change in both "fallout.ini" and "falloutprefs.ini" in your "Documents\My Games\FalloutNV" path. 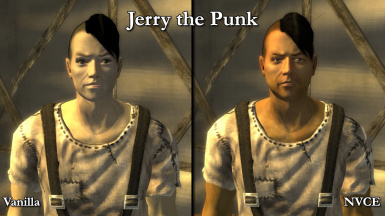 If this happens to only a selection of NPCs, it could be a loose-end of the mod. You should take note of the NPC (by refering to their RefID) and leave a comment. 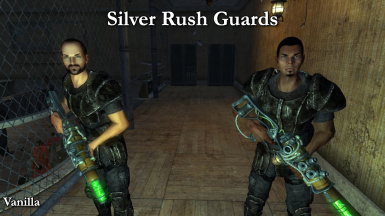 As the title suggests, the main goal of this mod is to change Non-Playable Characters within the world of Fallout: New Vegas. These changes are primarily related to the cosmetics of that character; their physical appearance (face, hair, skin colour). 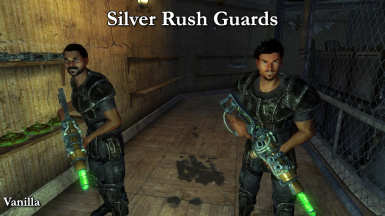 They may also undergo stat changes, inventory changes, dialogue changes, and placement changes where appropriate. 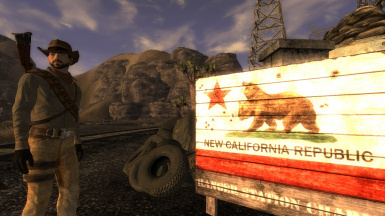 Be not discouraged however, as I've personally endeavoured to keep this mod 100% loyal to the lore of Fallout and the original view of New Vegas. 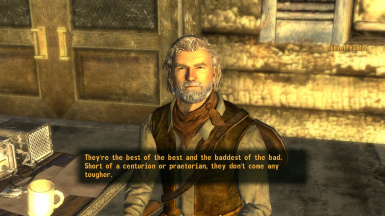 This means you won't be see any bold changes to the game that radically differ it from what New Vegas used to, and should be. 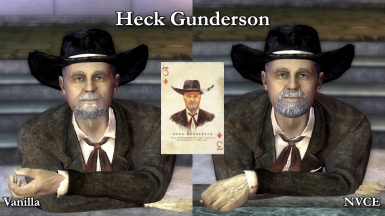 This mod in comparison to "New Vegas Redesigned", still remains true to the original focus of NPCs. 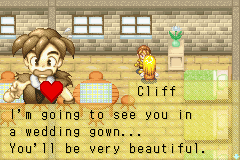 Rest assured also that I won't be abandoning the community without notice, and that this mod edits more (more!) 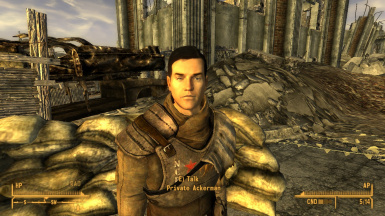 NPCs than NVR does. 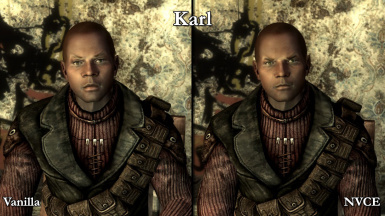 The original reason for this mod was because I was sick and tired of the Vanilla's terrible characters, who featured hilariously disproportional faces, wacky hair colouring, incorrect aging, clipping problems, and more. 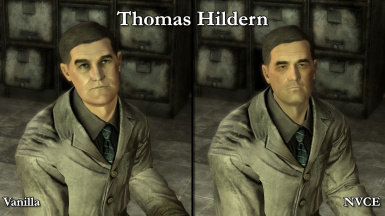 What is worse, Obsidian grew incredibly lazy with their character designs, opting to re-use NPC faces through levelled actor lists and the Base Player Male model for atrociously large amounts of NPCs (Old World Blues 1/4 of all NPCs are base model males, indication absolutely no effort was involved in attempting to differentiate them). 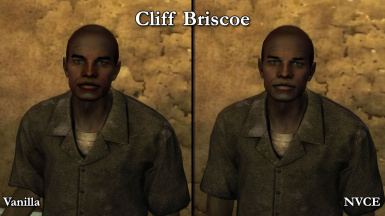 Some named NPCs within the Vanilla game have been fairly well made, but these are few. 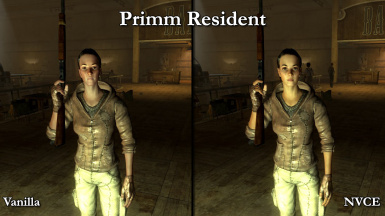 Please keep in mind that this mod may conflict with other NPC manipulating mods and is not compatible with compilation mods such as Mission Mojave or NVEC that are using older versions of this file. You have been warned. 1. 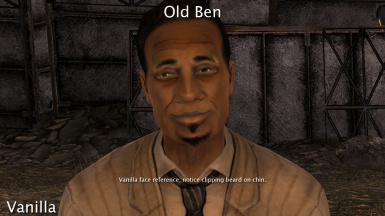 Open Fallout Mod Manager. 2. Select Package Manager option. 3. Choose the "Add FOMod"
4. Select the ZIP file. 5. Choose your configuration, and accept all the changes. 6. Once the mod has loaded in the list, highlight it and choose "Activate". 8. Make sure "bLoadFaceGenHeadEGTFiles=0" is set to 1, which is located within the "[General]" section. 9. Enable the ESP file within the Fallout Launcher from the "DATA" option (or Nexus Mod Manager if you're using it). 1. 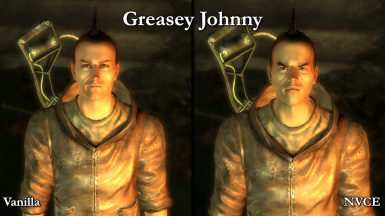 Copy the files to your Fallout New Vegas Directory's "Data" folder. You can choose which files you want, but make sure you have the corresponding BSA file for the ESP. 3. Edit "bLoadFaceGenHeadEGTFiles=0" to 1, which is located within the "[General]" section. 5. Enable the ESM file within the Fallout Launcher from the "DATA" option. For update files, you need to install the main CORE files (these are file versions of one decimal point. ie. 1.1, 1.2, 1.3...) if you are installing NVCE for the first time. Then, assuming you should open the update zip file and paste over the core files installed prior. Uninstallation requires simply deleting the ESM/ESP and Data files associated with the mod. They should be appropriately named with the prefix "NVCE". With FOMM, you can simply go to the Package Manager, highlighting the mod and choosing "Deactivate". These instructions assume you already have Wrye Flash up and running. 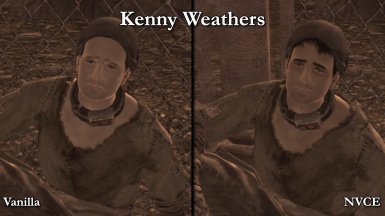 Please note that earlier versions of Wrye Flash (Version 13 or lower) do not support the "NPC.Race" tag, therefore causing visual anomalies and problems. It is advised to upgrade your version of Wrye Flash, unless you don't mind seeing ugly people. 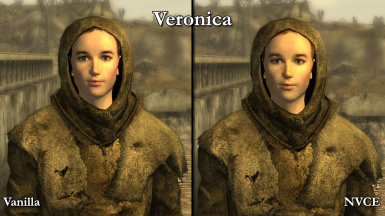 Which would be ironic considering you downloaded this mod for quite the opposite. - Check if you have a file called 'Bashed Patch, 0.esp' in your data folder. 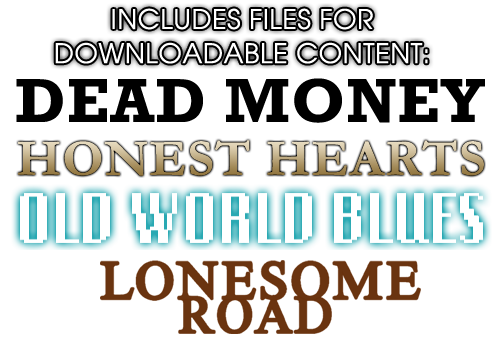 - If you don't have that file please navigate to your Wrye Flash directory (default: Fallout New Vegas\Mopy). 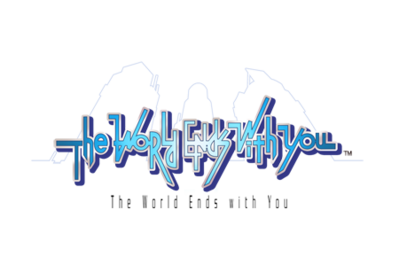 - Users of Wrye Flash 14 (or later) will find the file in Mopy\templates. - Users of older version will find it in Mopy\Extras. - Copy 'Bashed Patch, 0.esp' to your data folder. The Bashed Patch is a completely empty ESP file as of yet and needs updating. Note: These steps will only help you to fill it with information from NVCE. If you need general directions please check the ReadMe (Mopy\Wrye Bash.html). - Open up Wrye Flash. - Make sure that 'Bashed Patch, 0.esp' is the last file in your load order. - Right-click on 'Bashed Patch, 0.esp'. - Select the option 'Rebuild Patch'. - A new window will pop up. - [OPTIONAL] When using 'NVCE DLC03.esp': Check the box 'Merge Patches' choose 'NVCE DLC03.esp'. This option will merge the ESP in the Bashed Patch completely and keep your ESP count low. - Check the box 'Import Actors' and choose 'NVCE Main.esm', 'NVCE DLC01.esp', 'NVCE DLC02.esp' and 'NVCE DLC03.esp'. - When using 'NVCE DLC02.esp': Check the box 'Import Inventory' and choose 'NVCE Main.esm' and 'NVCE DLC02.esp'. - Check the box 'Import NPC Faces' and choose 'NVCE Main.esm', 'NVCE DLC01.esp', 'NVCE DLC02.esp' and 'NVCE DLC03.esp' . - When using 'NVCE DLC02.esp' and/or 'NVCE DLC03.esp': Check the box 'Race Records' and choose 'NVCE DLC02.esp' and 'NVCE DLC03.esp'. - Click on the 'Build Patch' button. - Wait for the Bashed Patch to be updated. - Make sure that 'NVCE Main.esm'and the Bashed Patch are activated. If you have choosen to merge 'NVCE DLC03.esp' into you Bashed Patch earlier then make sure that this one is deactivated. - [OPTIONAL] When using 'NVCE DLC03.esp': Check the box 'Merge Patches' choose 'NVCE DLC03.esp'. This option will help you to keep your count of ESP files low. - Check the box 'Import Actors' and choose 'NVCE Main (Faces Only).esm', 'NVCE DLC01.esp', 'NVCE DLC02.esp' and 'NVCE DLC03.esp'. - When using 'NVCE DLC02.esp': Check the box 'Import Inventory' and choose 'NVCE DLC02.esp' . 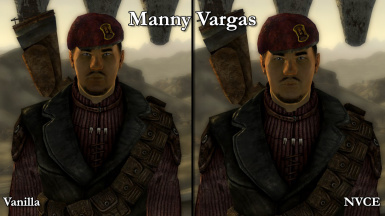 - Check the box 'Import NPC Faces' and choose 'NVCE Main (Faces Only).esm', 'NVCE DLC01.esp' , 'NVCE DLC02.esp' and 'NVCE DLC03.esp' . - Make sure that 'NVCE Main (Faces Only).esm' is deactivated while your Bashed Patch is activated. If you have choosen to merge 'NVCE DLC03.esp' into you Bashed Patch earlier then make sure that this one is deactivated. CHAIRMAN GREETER +Grimy Pre-war Businesswear. Deputy Beagle +Dynamic name-change where appropriate. 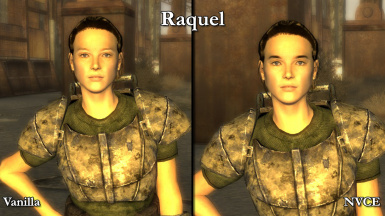 NCR MP +Renamed to "NCR Military Police"
RAD PACK DANCERS +Individual looks. 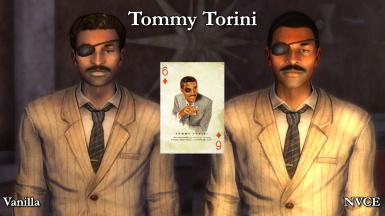 Rat Pack references. Frank Sinatra, Dean Martin and Peter Lawford. Quest specific Brotherhood Paladins have had power armour combinations changed to now match consistently. 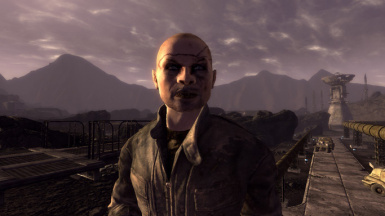 *This has been reverted as it was brought to my attention that it was intended so as to reference the Mojave branch's slightly more 'rag-tag' nature. Final Quest NPCs revamped with individual faces and removable apparel (still factional armour). 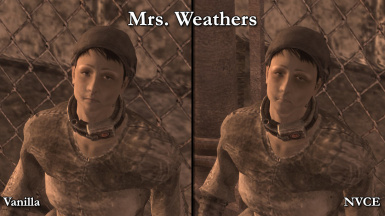 2 additional Goodspring Settlers added. 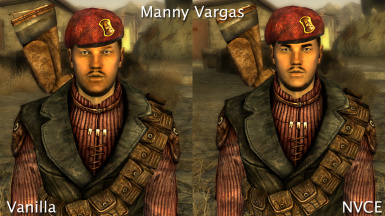 Expanded variants of North Vegas NPCs. Deputy Beagle will dynamically rename to 'Beagle' once spoken to after consequences demote him from his status. Green eyes made slightly more prominent [Optional]. 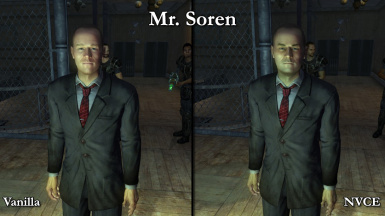 These alignment changes were brought about initially from Josh Eric Sawyer's mod, and I was in complete agreement with those changes. 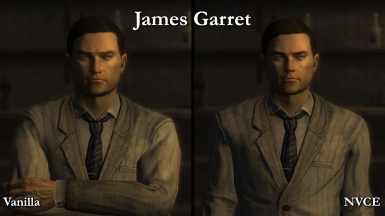 These changes in alignment are meant to demonstrate either 2 aspects. One being the ideals that the character stands for, and the other being the effects of their death. 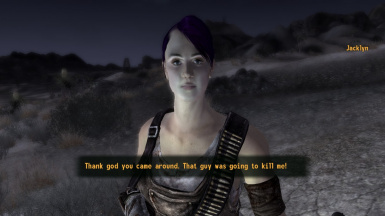 For some unknown reason, New Vegas may have problems with awarding Karma for the deaths of certain people. 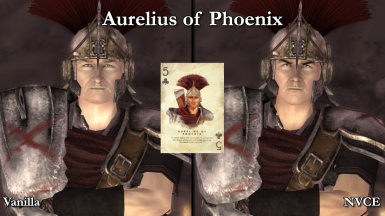 Tested on people such as Alice McBride, Caesar and Vulpes Inculta, Karma is randomly awarded correctly, and other times not even registered. 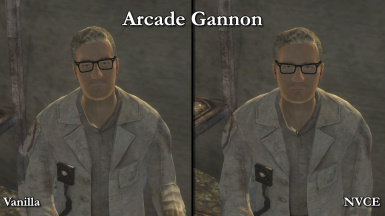 *Please note that in referencing Karma Farming, these changes have been made to make your FNV experience more immersive and balance out the karma system, which is ridiculously biased towards Good Karma. 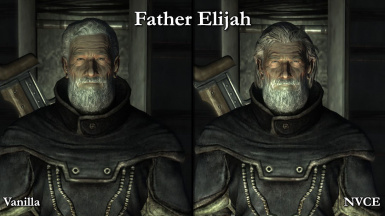 Father Elijah - Facial regeneration for meaner look, and given blast back hair. 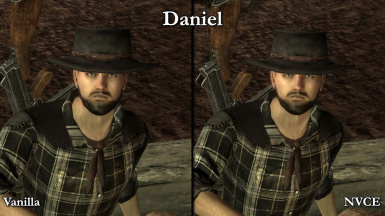 Daniel (Honest Hears) - Eyes narrowed to change from the 'cat like' eyes prior. DEAD HORSES - All tribal members have been given variance. Originally they all used the same mode (Ugh). 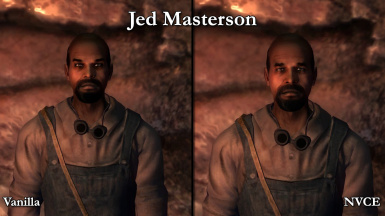 Jed - Slight facial regeneration. 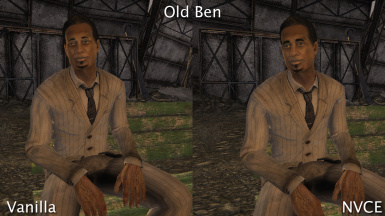 Made older and fixed eyes so he doesn't have those hideous cat eyes. 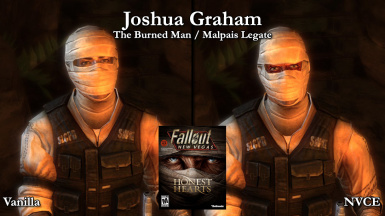 Joshua Graham - Face and eyes changed to match promotional boxarts' and now with moving facemask. 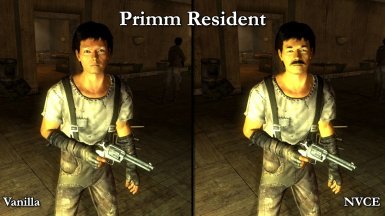 (Thanks to Authentic Burned Man Mod!). 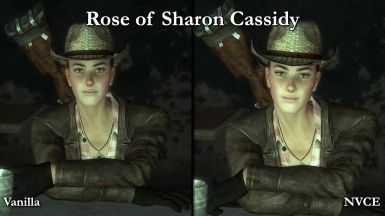 HAPPY TRAILS CARAVAN GUARD - Facial regenerations for meaner looks. 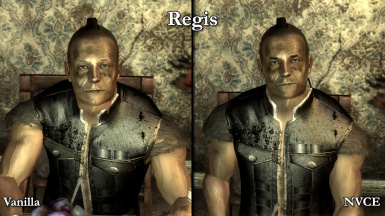 Ricky - Facial regeneration and eyes fix. SORROWS - All tribal members have been given variance. Originally they all used the same mode (Ugh). Stella - Improved facial features. WHITE LEGS - All tribal members have been given variance. Originally they all used the same mode (Ugh). 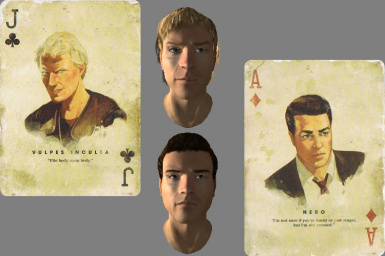 LOBOTOMITES - All have undergone facial regenerations. 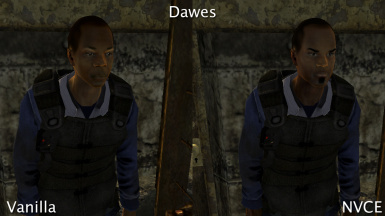 Now each has a unique face instead of reusing base models. Also fixed up upper body texture to now show scarring! FOR SCIENCE! 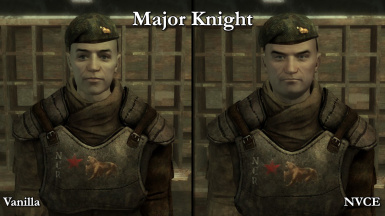 MARKED MEN - All have been given variations. Now they all don't look generic. 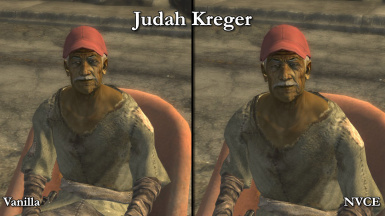 How often will this mod be updated? As often as possible. 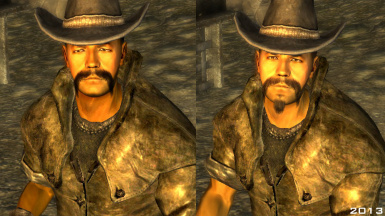 Whenever I encounter an NPC who doesn't look right, or has any number of issues such as clipping, reuse of the same model etc, I will make changes where appropriate. You haven't properly installed the mod. 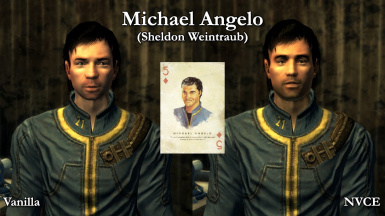 Remember to edit "bLoadFaceGenHeadEGTFiles=0" to 1, which is located under the "[General]" section of the "fallout.ini" file. This may also however be a loose-end of the mod. If so, please contact me immediately! 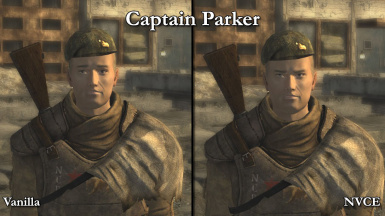 Can I help with this mod? Definitely. Simply leave a comment. 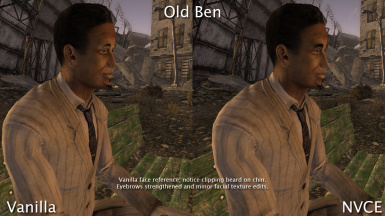 You can leave things such as suggestions to what alterations this mod makes that need to be changed (things of this mod that you don't like). You can also suggest NPCs which aren't already altered, to be altered in the next update. 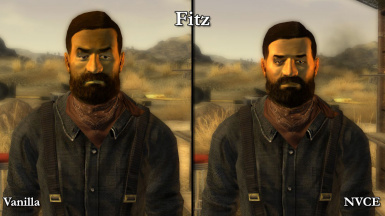 How should I suggest which NPCs, I would like 'fixed' in the next update? Leave a comment, providing details on WHO the person is (ie. 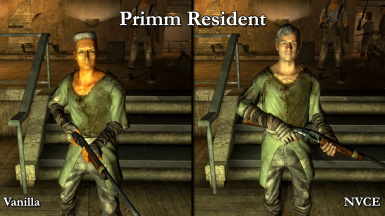 Primm Resident, Freeside Resident etc), what they look like (ie. African American with short hair, Asian with large nose and mohawk etc.) and what's wrong with them (and subsequently what you think needs to be changed). 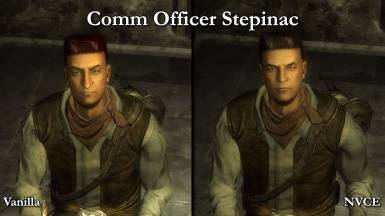 Problems with NPCs can range from bad skin tones, bad faces, bad hair, clipping issues or just looking too generic and needing variation. Will you still make alterations to characters who have already been edited before? Yes, if there is if it recommended by the general public. 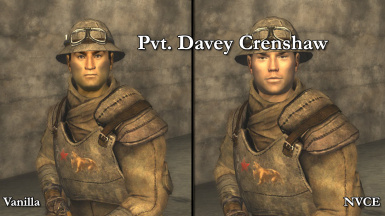 Though I will discourage such things for mass amounts of characters, such as generic NCR and Legion soldiers. Seriously, there's too many to go over again and again. Is there anything else I should know about this mod in advance? There are some problems that you may encounter, which I myself have upon testing. 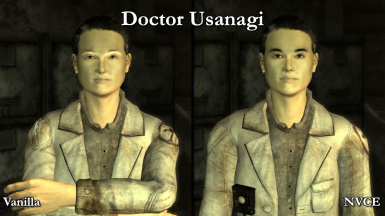 Other NPC manipulating mods might conflict with this mod. Inventory changes will not be instant with some characters, and may need manual resurrecting. As this mod has developed, so has its scope. 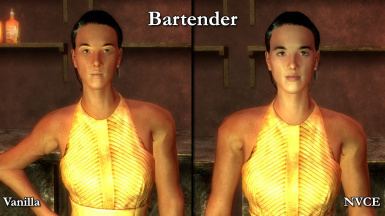 Currently, there are no restrictions on which NPCs may be altered.